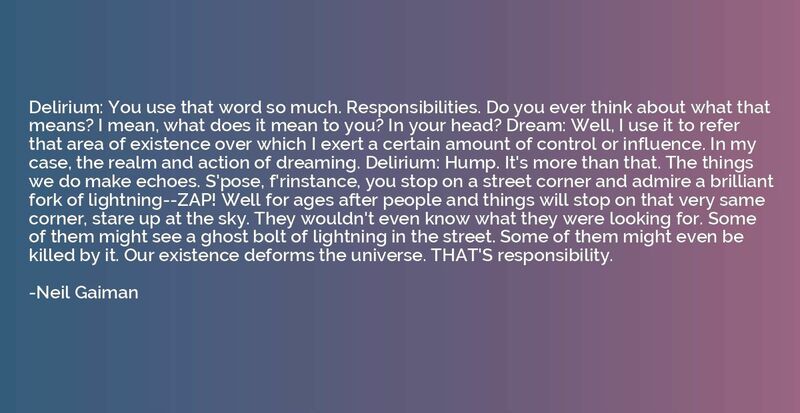 Delirium: You use that word so much. Responsibilities. Do you ever think about what that means? I mean, what does it mean to you? In your head? Dream: Well, I use it to refer that area of existence over which I exert a certain amount of control or influence. In my case, the realm and action of dreaming. Delirium: Hump. It's more than that. The things we do make echoes. S'pose, f'rinstance, you stop on a street corner and admire a brilliant fork of lightning--ZAP! Well for ages after people and things will stop on that very same corner, stare up at the sky. They wouldn't even know what they were looking for. Some of them might see a ghost bolt of lightning in the street. Some of them might even be killed by it. Our existence deforms the universe. THAT'S responsibility.